ADAS stands for Advanced Driver Assist Systems and is one of the fastest-growing segments in automotive electronics. Made up of different technologies ADAS is designed to avoid collisions and accidents by warning drivers or taking over control of the vehicle whenever hazards are detected. 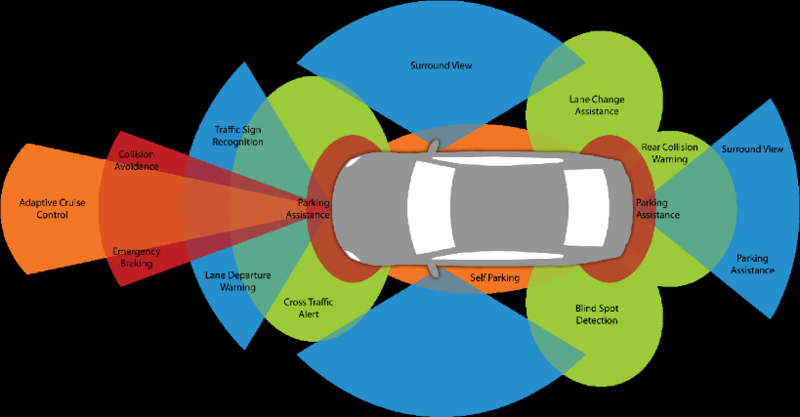 ADAS relies on inputs from a variety of sensors that allow the systems to “see” what is happening around the vehicle. Features such as automatic emergency braking, adaptive cruise control, parking assistance, blind spot and pedestrian detection, lane departure warning, drowsiness monitoring and night vision are just some examples of the ADAS features in today’s cars. Many of these safety features are standard in new vehicles and others are still optional though expect this to change quickly as aftermarket solutions become increasingly available for late model cars. Knowing if your vehicle has ADAS is important because if any of the components containing ADAS sensors are disturbed or damaged there is risk of malfunction and possibly injury if the component is improperly repaired or installed. Even if out by a single millimeter or degree a sensor’s aim can alter its trajectory by 15 or more metres down the road. Typically, new model vehicles have between 60 and 100 sensors most of which are commonly located in the front or rear end of vehicles which, coincidentally, are areas most likely to be affected in a collision. Your front bumper, for instance, may contain up to 6 park assist sensors, an airbag sensor, a front view camera and a front wave radar. A rear bumper typically contains up to 4 park assist sensors, 2 blind spot detection sensors, a rear millimeter-wave radar, and a rear view camera. Damaged windshields present a big risk to safety because the windshield is a major part of the vehicle’s interlinked safety system and is loaded with sensors. If damaged or broken, be sure to have your windshield repaired or replaced immediately. Also know that if the windshield is disturbed or replaced any ADAS may need to be recalibrated. Without doubt ADAS technologies have resulted in huge advances in vehicle safety that, in turn, have revolutionized the way vehicles are repaired. New technology requires constant investment in new tools, equipment, education and training and equally important, consumer awareness. Bottom line know what ADAS your vehicle is equipped with and only entrust your repairs or system maintenance to certified repair professionals with demonstrated experience and training.